Here are some of the dozens of shoes collected in St. Paul the Apostle Parish's "My New Shoes" program to benefit kids in area schools in need of new shoes. Several volunteers helped sort and prepare the shoe and sock donations given to the "My New Shoes" program led by St. Paul the Apostle Parish. The donated shoes and socks were distributed to kids in schools in the greater Bangor area. Adidas. Converse. New Balance. Nike. Each fall, you will find pairs upon pairs of new sneakers lining tables in the hall of St. Mary Church in Bangor. 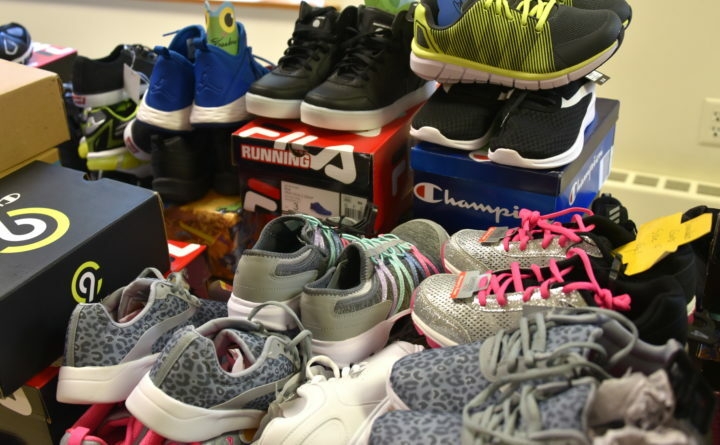 From pink ones with purple swirls sure to catch the eye of a kindergartener to the trendsetters favored by teens, the sneakers were all donated by members of St. Paul the Apostle Parish to be given to students throughout the greater Bangor area. “There is a great need for shoes and clothing for children. I heard it through friends in the schools. The teachers say that there is a great need for the children to have those things,” says Sheila Cookson, a parishioner from Brewer, who donated sneakers. “I feel really blessed in my life, and I wanted to give to someone who is not as blessed,” says Nancy Santerre, a parishioner from Hermon. “I just wanted to give to support children and their needs,” says Ellen LeClair, a parishioner from Bangor. “Every year, we give a pair or two or some socks. I think it’s a wonderful program,” said Joan Staffiere, a parishioner and former school principal. “There is a need out there. It certainly expands the self-esteem of children when they have the proper clothing and shoes for gym. It makes them just feel good about themselves,” said Gene, her husband, also a former principal. The “My New Shoes” program was started nine years ago by Susan Shaw, who has attended St. Mary Church throughout her life. Shaw says the idea came to her after a friend told her the story of a teacher who had bought sneakers for a student after seeing the sole of his shoes flapping in the rain as he walked. She remembered her aunt had once told her about a parish in Colorado that had a store which provided shoes, and she wondered if something similar could be done at her parish. “I thought, ’Gee, why can’t we do something similar, but not a store, more of a supplying to all the students in our parish?’” she says. Parishioners embraced the program from the beginning. Each September, a team of volunteers hands out tags with various shoe sizes listed on them to interested parishioners at the six churches that make up St. Paul the Apostle Parish. Over the following weeks, parishioners buy the sneakers and drop them off before Masses. “It’s great to know that all we have to do is put it out, and people are very generous. They pick up the slips and bring back the shoes, and we’re good to go,” says Dave Teixeira, who volunteers with his wife, Maureen. Parishioners are also invited to buy socks, which are also given out to students, or to donate money, which is used to buy additional pairs of sneakers if there is a greater than anticipated demand for a certain size. “Some people, if they can’t afford a pair of sneakers, because they are expensive, they’ll give socks, and we really need them. Others will say, ‘I don’t know what to buy,’ and they’ll drop in a $20 bill,” explains Shaw. Once the shoes are collected and organized, volunteers connect with representatives from area elementary and middle schools, most often guidance counselors, to assess the need. “All the volunteers have schools that are assigned to them, so it’s our job to make contact with the school, to find out who the contact person is, what the needs are, and to fill those needs,” says Spike Brimmer, who volunteers with his wife, Sharon. While most of the shoes get delivered in the fall, the school representatives know they can contact the volunteers at any time if a need arises. This year, parishioners gave 388 pairs of sneakers, 1,168 pairs of socks, and $1,244 in cash. There were also backpacks donated, as well as 200 handmade hats from Marion Mitchell and Dawn Bennett. “I think we’re a parish that really has a heart for the needy,” says Shaw. “The parishioners are the most generous people I’ve seen. While “My New Shoes” originally only served schools in Bangor and Brewer, now sneakers will go to students in Baileyville, Carmel, Eddington, Glenburn, Hampden, Hermon, Holden, Indian Island, Kingman, Levant, Old Town, Orrington, and Winterport, about 20 schools in all. Some will also be donated to the Mason Place Transitional Living Program, which serves homeless young people aged 16-20. “Usually, there is not much left at the end of the year. They’re all being given out, so that just says that hundreds of kids need them,” says Shaw. The volunteers say they know the program is making a difference. Joel Bragdon, the physical education teacher at Downeast School in Bangor has seen the difference the program makes. He says he sometimes sees children wearing sneakers with holes or with soles barely attached. He says he distributes about 40 pairs a year to the pre-K through grade 3 students. Bragdon says he’s been teaching for 25 years, and each year, the need seems to grow. Shaw says that is why she wants to spread the word about “My New Shoes.” She says it’s not a difficult program to run, and the benefits are great. Reprinted from Harvest magazine with permission from Roman Catholic Diocese of Portland.